After finishing my Seaside Scarf, I had a bit of leftover yarn and so to keep it from languishing forgotten in the bottom of my yarn drawer, I had a go at making a few flowers. I've done this many times, with many bits of leftover yarn. There is something so satisfying about making crochet flowers; I spent a lovely evening sitting on the sofa in my pajamas, with a tea and a candle burning, crocheting these beauties - true relaxation. These flowers are excellent as coasters, and also look adorable under a flower pot. I have a small windowsill in the kitchen and I love to put plants there as it is the only place in my house where plants survive. 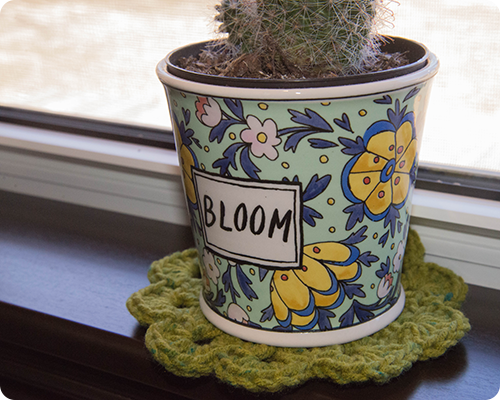 And nothing is more homey than a little plant sitting atop a crochet flower. Now, this pattern is not my own, I printed it from somewhere years ago, and for the life of me I can not find the link anymore. So I've included the pattern here should you wish to make a few flowers of your own. From my experience any yarn type works well, just remember that the bulkier the yarn used, the larger your flower will be. Round 2: ch 3 (counts as first dc), dc in next dc, *ch 2, dc in each of next 2 dc**, repeat the directions between * and ** around, then ch 2, slip stitch in top of first ch-3 of this round. Round 4: slip stitch in next dc (to reach starting point for this round), slip stitch in ch-2 space, ch 3 (counts as first dc), (6 dc, 1 sc) in same ch-2 space, *(7 dc, 1 sc) in next ch-2 space**, repeat directions between * and ** around, then slip stitch in the top of the first ch-3 of this round, end off. Make several flowers and put them in a little pile - so satisfying. 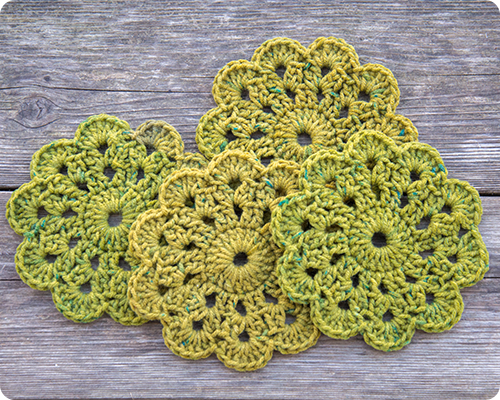 You are right, these flowers are very similar to the Maybelle Crochet Flower, though just slightly different. I actually made a Maybelle Flower Blanket last year and love it very much.